On-tour flights are not included in the tour price and must be purchased through Cosmos to participate in this tour. Single accommodations are available on this tour for an additional charge. Extra nights in Lima are available for an additional charge. History comes alive on this tour through Peru, designed for savvy, value-minded travelers. Imagine what life was like in the 15th century as you tour the ancient ruins of Machu Picchu, where you’ll see this famous Inca complex of palaces, plazas, temples and homes set in a majestic mountain setting. More history awaits at Ollantaytambo, the archaeological site of the Incas’ resistance during the Spanish conquest, and the Temple of Sacsayhuaman, a fortress with some of the best examples of Inca masonry. Guided sightseeing in Cusco features the Santo Domingo Monastery, where the Inca foundations remain under the Spanish baroque structures, and the Cathedral in Plaza de Armas, housing a magnificent collection of artwork. On this Peru tour you’ll also learn about the local culture. On a motorboat tour of Lake Titicaca you’ll visit Taquile Island, where you’ll see how the local people integrate their Inca and Spanish past, and the Uros Floating Islands, where you’ll learn how the Uros Indians construct their islands, homes and boats from tortora reed, a centuries-old practice. In the Incan town of Ollantaytambo and in Sillustani, visits with locals in their homes give you insight into their way of life. Spend time at the Indian market in Pisac and in Awanakancha and learn about the importance of camelids (llama, vicuña, alpaca and guanaco) to Inca culture. Cosmos vacation packages include comfortable and attractive hotels, guided sightseeing, a dynamic assortment of transportation and many of your meals. Enjoy the benefits, security and convenience of escorted travel with an expert Tour Director, a greater choice of activities and excursions and longer stays in key cities so you can immerse yourself in the culture. Welcome to Peru! Heralded as the “City of Kings” by Spanish conquistadors, Lima retains vestiges of its opulent past with its colonial buildings and world-class museums. Sightseeing today focuses on Lima’s colonial heritage. Founded in 1535, Lima was once the capital of Spain’s South American Empire. Visit the baroque 11th-century San Francisco Monastery, with Spanish and Moorish architecture throughout. Continue to Plaza Mayor, where you will see the Government Palace that houses the presidential palace and was once the home of Francisco Pizarro, founder of Lima and conqueror of Peru. Nearby see the cathedral where Pizarro’s remains are buried. The remainder of your day is free to explore on your own. Enjoy dinner at a local restaurant this evening. 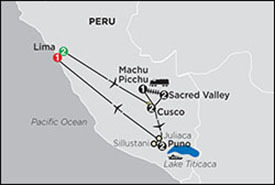 Fly to Cusco high in the Andes and descend into the Sacred Valley of the Incas. (On-tour flights are not included in the tour price and must be purchased through Cosmos to participate in this tour.) Stop at Awanakancha and learn about the importance of camelids (llama, vicuña, alpaca and guanaco) to Inca culture. See them up close and learn how their coats are transformed into precious weaving fibers and about ancient weaving techniques still in use today. Continue to Pisac, a charming village with an infamous Indian Market, where you will have plenty of time to browse the many colorful stalls selling handicrafts ranging from alpaca sweaters and blankets to painted vases and sterling silver. Later arrive at your hotel in the peaceful Sacred Valley. Start the day with a visit to the village of Ollantaytambo and the Inca ruins of the same name. Explore the archaeological site that was the scene of the Inca resistance during the Spanish conquest, the only place ever to resist Spanish attacks. See how the temple area at the top of the terraces was the perfect defensive stronghold. Next visit a local home in this Incan town to experience life in a traditional village, which has been remarkably well preserved. Visit the Seminario Ceramics Workshop to learn about Peruvian ancient and modern art. End your day at a local chicheria for a taste of a chicha, a typical Inca drink. Board the Vistadome train that cuts a path through the picturesque Urubamba Valley bound for Aguas Calientes, the quaint town closest to the “Lost City of the Incas.” Ascend the mountainside through tropical forest to the sacred refuge of Machu Picchu. Listen as your Local Guide recounts the many accomplishments of the Incas as you tour the terraced ruins dating back to the 15th century. The ruins went undiscovered for nearly 400 years after they were abandoned when the Inca Empire fell to the Spanish. Many mysteries surrounding Machu Picchu remain to this day. Enjoy some free time this morning to explore the mountain town of Aguas Calientes; perhaps visit the local market and quaint boutiques, or take a walk along nearby trails. Later this afternoon return to Cusco, former capital of the Inca Empire. Embark on a guided sightseeing tour of Cusco that focuses on the city that was once the political, military and cultural epicenter of the Incas until the Spanish toppled it. In fact, Inca foundations can still be found in Cusco, with Spanish baroque structures built on top. Visit the Santo Domingo Monastery, where these two forms of architecture are melded together with the temple of both cultures atop one another. Also see the cathedral in the Plaza de Armas, housing a magnificent collection of artwork, including a depiction of the Last Supper that portrays the apostles dining on cuy (guinea pig). Continue to the hillside overlooking Cusco for a visit to the Temple of Sacsahuaman. Some of the best examples of Inca masonry can be found at this fortress, where stones weighing up to 350 tons are pieced together to form a complex that could house up to 10,000 men. Learn about the ceremonies and battles that took place here; then see the ruins of Kenko and Puca Pucara before returning to Cusco. Fly to Juliaca, then transfer to Puno on the shores of Lake Titicaca. (On-tour flights are not included in the tour price and must be purchased through Cosmos to participate in this tour.) Legend says the first Inca, Manco Capac, arose from the waters of the lake by the power of the sun god to found the Inca Empire. Experience fascinating Lake Titicaca today as you embark on a motorboat tour of the highest navigable lake in the world and its manmade islands. On Taquile Island, see how the local people integrate their Inca and Spanish past. This is evident by the Spanish peasant dresses made of Andean textiles—the islanders make some of the finest in all of Peru. Continue to the Uros Floating Islands, a group of approximately 40 artificially made islands. Learn how the Uros Indians construct their islands, homes, boats and many other resources completely of tortora reed, a centuries-old practice. Enjoy a Farewell Dinner hosted by your Tour Director this evening. Call 800.459.1597 to Book Your Cosmos Tour of Peru Today! Prices based on availability, per person double occupancy and subject to change without notice. Includes accommodations; 16 meal; on-tour motorcoach transportation; Vistadome train transportation from Sacred Valley to Aguas Calientes; guided sightseeing; admission fees to attractions; and all taxes and service changes. On-tour flights are not included in the tour price and must be purchased through Cosmos to participate in this tour. Gratuities are included for services during the land stay of your vacation and include wait staff at included meals, hospitality staff at hotels for nights purchased through Globus (Cosmos), and porterage at hotels for one suitcase per person. Gratuities for your Tour or Cruise Director, Local Hosts, Local Guides, Tour Driver, or ship’s crew are not included in the vacation price and are discretionary. See full terms and conditions. Price is per-person based on double occupancy, including accommodations; 1 meal; guided sightseeing; admission fees to attractions; airport transfers for inter-island flights and at end of tour; and all taxes and service changes. On-tour, inter-island flights are not included in the tour price and must be purchased through Cosmos to participate in this tour. Gratuities are included for services during the land stay of your vacation and include wait staff at included meals, hospitality staff at hotels for nights purchased through Globus (Cosmos), and porterage at hotels for one suitcase per person. Gratuities for your Tour or Cruise Director, Local Hosts, Local Guides, Tour Driver, and ship’s crew are not included in the vacation price and are discretionary. Prices and availability are subject to change without notice. Fares shown are in U.S. dollars for new reservations only and are subject to availability. Please call us at 800.459.1597 for more information. This offer may not be combined with any other offer/promotion and may be withdrawn at any time. Airfare, airport transfers, car rental, optional tours and attraction tickets, and items of a personal nature are not included. Great Vacation Destinations, doing business as Bluegreen Travel Services, is located at 12400 S. International Drive, Orlando, FL 32821. Great Vacation Destinations is registered with the State of California as a Seller of travel Reg. No. 2068362-50 (registration as a seller of travel does not constitute approval by the State of California); Washington Seller of travel Reg. No. 602-283-711; and registered with the Airlines Reporting Corporation (“ARC”) number 15-72225-4. In the event of a conflict between Cosmos’ Details of Participation and Great Vacation Destination’s Details of Participation, Cosmos’ Details of Participation will govern.